AT#11: Build strong connections between Solution- and Enterprise Architecture! In most companies I know, enterprise-wide architecture models are designed by a few enterprise architects and are typically not widely accepted by developers. Today, agile solution teams and enterprise architects are separated by huge walls of ignorance and misunderstanding. Enterprise architects (EAs) manage their repository of artifacts and build to-be roadmaps. Solution teams do not care about the work of the EAs and do whatever their product owner wants them to do. Strong links between solution architecture and enterprise architecture seldom exist, which questions the use of the latter at its very core. To deal with this situation, the Architectural Thinking Framework® defines three levels of architecture: (i) enterprise, (ii) top-level capability and (iii) solution. Approximately 80% of architectural work is carried out during implementation at the solution level. A team creates architectural maps that are specific for the solution collaboratively but connected well with the maps on the higher (capability/enterprise) levels. An ‘Architecture Owner – Solution’ is responsible for the conceptual integrity of the solution, which means that the micro-architectures of each team member fit together. 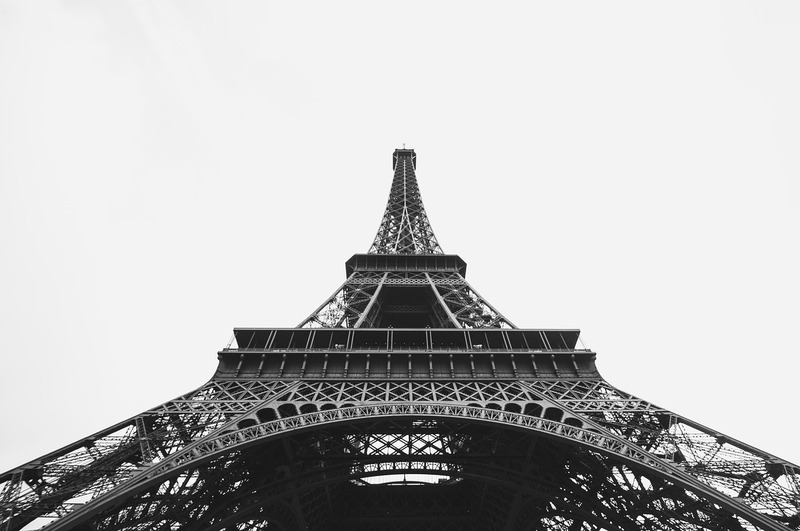 Speaking with an Eiffel Tower metaphor: solution architecture can be seen as the four strong pillars, that ground your architecture to the reality. In order to ensure that solutions that support the same top-level business capability fit together, single-minded architectural work at the capability level is required. An ‘Architectural Owner/Capability’ creates the capability-wide architectural maps by aggregating and consolidating the work carried out at the team level. The remaining maybe 1% of architectural work is carried out at the enterprise level. An ‘Architectural Owner/Enterprise’ creates the enterprise-wide architectural maps by aggregating and consolidating the work carried out at capability and solution level. 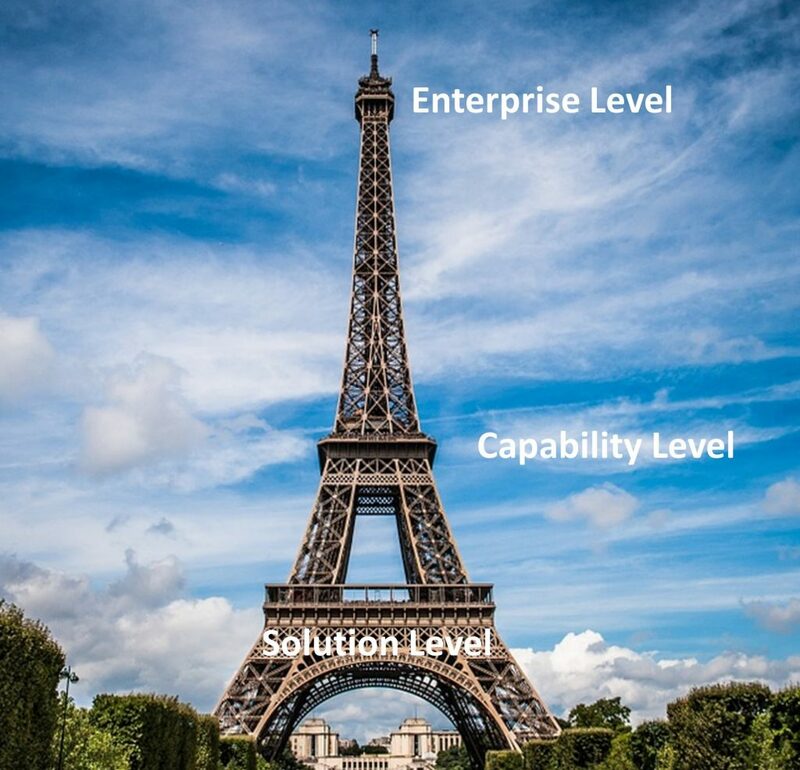 Enterprise level architecture can be seen as the small platform on top of the Eiffel Tower, it is (i) small, i.e. done by a few people, (ii) it keeps a high-level overview and (iii) is based on the strong foundation of the solution- and capability architecture. Architectural work is permanently carried out at the detailed solution level and at the capability and enterprise level side by side. Many solution teams create architecture within their scope simultaneously. Whenever they find issues relevant at the capability level, they take them to this higher level, where the architectural owner has to integrate them into the target architectural maps for his capability. AT#7: Collaborate! Or: beware of Ivory Tower Architects!